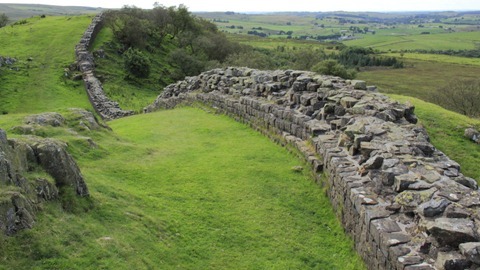 Well, apart from maintaining law and order, and developing central heating, starting in AD 122 they built a wall across the almost 80-mile width of northern England to keep out the Barbarian Scots. 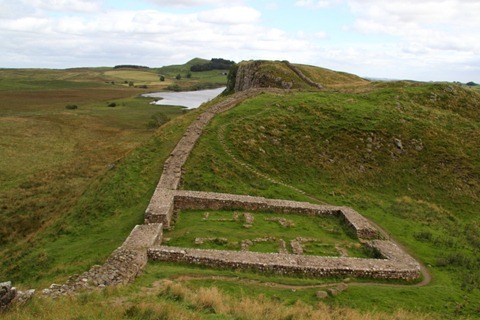 The Romans used walls to mark what they considered to be the frontiers of civilization. We should have taken note. By contrast, nearly nearly two thousand years later and having given Scotland its own parliament with considerable autonomy (which is more than England has), we wittingly installed in Westminster a Labour government, constituted largely of senior Scottish MPs, in particular the then disastrous chancellor Gordon Brown – sell gold reserves at an all time low, kill the pensions industry with sudden taxation, etc. – to ru(i)n our country once so considerately defended by the Romans. Talk about dense! Today, rain being low on the radar, we went to see our historic northern frontier of the civilized Roman world, Hadrians’ Wall, which was our main reason for choosing to break our journey around Carlisle. There being 80 miles of the wall, our first decision was choosing which sections to visit. Being the most popular tourist attraction in northern England, however, there is no shortage of information to help in that regard. Not wishing to drive too far, our potential sites were determined by our location near the eastern end of the wall. We started off by heading for Housesteads, one of 16 Roman forts along the length of the wall. 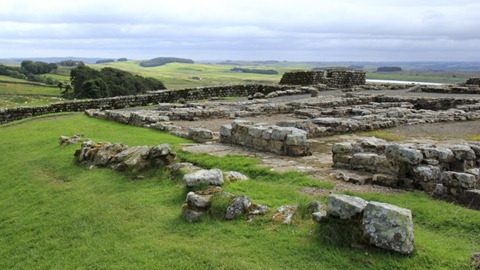 Housesteads, pretty much centrally positioned along the wall, was begun ~AD 124 and garrisoned up to 800 soldiers. It is now managed by English Heritage on behalf of the National Trust so Francine, being a member of the latter, was able to get in for free. Others must shell out £6 which, for a pile of old stones, I declined to do. Franco isn’t particularly into old stones but for those who are, here are a few for the record. Our second stop, a little further east back towards Guillaume, was to see what may well be the most photographed section of the wall. It was well known anyway but was made more famous – or should that be notorious? -by Kevin Costner’s relatively recent Holywood epic, Robin Hood, Prince of Thieves. Sycamore Gap is unarguably an impressively photogenic section of the wall with the eponymous sycamore tree rooted centrally in a sudden dip between two bluffs. The notorious bit is that it has more recently become known as Robin Hood’s tree. The eminent Mr. Costner, a.k.a. Robin of Loxley, apparently having made landfall at Dover and being on his homeward bound journey to Nottingham, is filmed at this very location defending a young poacher from the wrath of the Sherriff’s men. Dover to Nottingham via Hadrian’s wall? Nice one, Hollywood! With a sense of direction that bad, Robin of Loxley would have stood absolutely no chance of leading his band of merry men against the deliciously evil Alan Rickman. He’d never even have found the Sherriff of Nottingham. 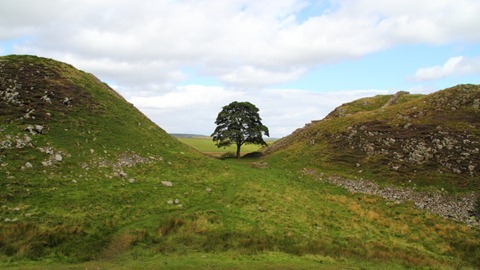 More sensibly, our route to Sycamore Gap ignored both Dover and Nottingham – well, we did have the advantage of an Ordnance Survey map – and took us from the car park at Steel Rigg, about a mile along the wall past the Roman’s milecastle 39. Very pleasant, though quite a lot of up and down. After all that walking up and down we couldn’t resist slaking our thirst at an inn in the intriguingly named hamlet of Twice Brewed. Very descriptively, the inn was called the Twice Brewed Inn. And before you ask, yes, there is also a little place nearby Twice Brewed called Once Brewed. Bizarre! Continuing east back towards Guillaume, our final stopping point, offering probably the best image of Hadrian’s wall itself, was at Walltown Crags. It would have been best had the sun put n an appearance without other grockels horsing about having their pictures taking in various autistic artistic poses whilst clambering along the top of the wall. What is it about walls that makes young folk want to walk along them? It’s very curious. It is very interesting, however, that this is a Roman relic that we allow people to clamber all over. Normally, such things are fenced off. Tourists used to be allowed to clamber all over an amazing Roman relic in France called the Pont du Gard. Very atypically for the French, that is now fenced off. As it was, we were forced to choose between sunlight grockels or dull and grockel-free. ‘T was a good day out, though a little windy and cold at times. What a pity that modern day Italians aren’t nearly as savvy as the Romans were. That’d help the Euro crisis.